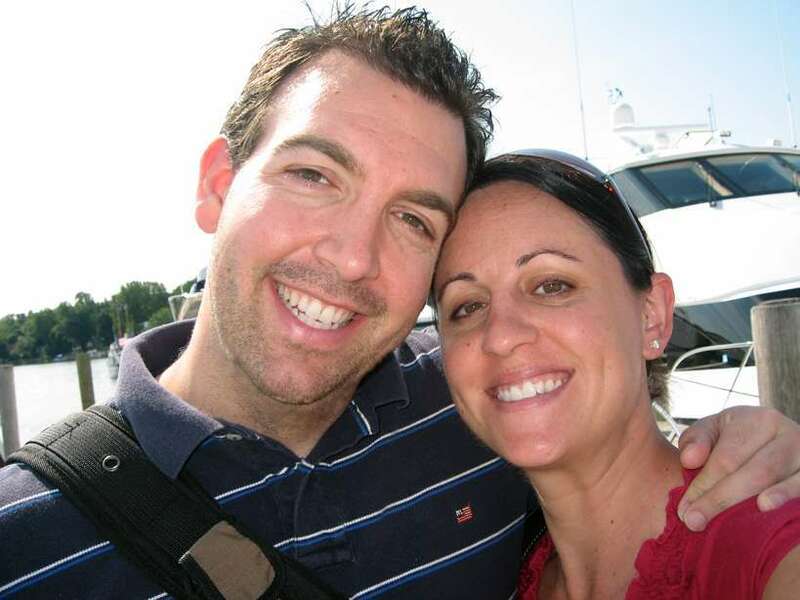 Meet Courtney and Jeremy our featured Cyber Love Story couple who found love on eHarmony. 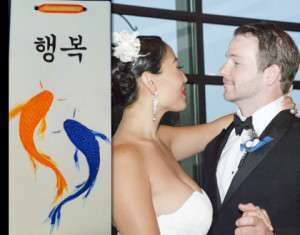 They recently got married in a fairytale wedding, followed by a romantic honeymoon in the Caribbean. It was Courtney’s goal to find someone special to marry and I promised her, she’d find the love of her life. I couldn’t be happier with her romantic journey. I met Jeremy three months into my 6-month subscription on eHarmony. He recently told me that we had been matched with each other months before we went out and that he was this close to deleting all his current matches when he saw my picture. We had only emailed a few times about dates to meet up for a drink so I didn’t know much about him. I actually couldn’t remember if his name was Jeremy or Jason so I did a panicked email search before he arrived. Thankfully I got his name just before he came through the door at the downtown bar/restaurant I picked. We ended up talking for a good two hours and he walked with me while we looked for a taxi. It was a great first date- the best first date I had been on in a long time, probably ever. I was cautiously optimistic because he was hard to read. The next day while telling two close friends how funny and good looking he was, I went to check my email and there was a funny message from him! I was thrilled. I might have done a little happy dance. We met for dinner and then drinks the next week and I went home to LA for a week-long visit the next day. He emailed me mid-week and we immediately made plans to see each other when I returned. From that point on we started dating regularly and finally months later, we started introducing each other to our friends. It was slow and steady and looking back it was perfect. I’m very emotional and dramatic while Jeremy is more quiet and analytical. He brings out my more practical side and I am constantly laughing at his dry humor. I think we are a perfect match. Last month we got married after a six-month engagement. The engagement was the only part of our relationship that went quickly! Now we are getting ready to spend our first holiday season together. For the last two years I’ve gone to LA and he’s gone to his parents’ home in New Jersey. Next week we will celebrate our first Thanksgiving together with his family (our puggle Wallis is coming with us to New Jersey) and then we’re spending Christmas week in New York with my parents, brother and sister in-law, and their new baby girl- our first niece! Thank you Julie for your wisdom and advice. I would not be marrying this wonderful guy if I didn’t follow your Playbook! Julie Spira is America’s Top Online Dating Expert and Digital Matchmaker. She’s been helping singles find love online for over 20 years. Find out how Irresistible Coaching can help you find your dream date. Follow @JulieSpira for dating advice and sign up for the free Weekly Flirt newsletter. Becky had been married for 30 years when her husband sadly passed away. Out of the dating scene for such a long time, she wasn’t sure what to do. One day, she decided to turn to online dating and joined Match.com. “It was the summer of 2011 when I joined Match,” explains Becky. Becky had a few dates, but they weren’t her cup of tea. Then in October of 2011, she started communicating with Philip. Phil had been single for over 10 years before meeting Becky. After talking via email and phone for a week or so, the two agreed to meet for a late lunch on October 13 at Pappy & Harriett’s. The next morning Philip emailed Becky and said…”You definitely have my attention”. They’ve been together ever since, splitting time between both Becky and Philip’s homes. When I saw Becky and Phil, they were celebrating their 2-year anniversary and couldn’t stop saying “I love you” to each other. Congratulations to Becky and Philip, who prove you can start your life all over again while looking for love online. Julie Spira is a top online dating expert and founder of CyberDatingExpert.com. 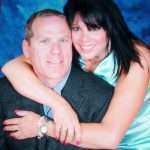 Julie was an early adopter of Internet dating and has been helping singles find love online for 20 years with her Irresistible Profiles and Online Dating BootCamp programs. Follow @JulieSpira for dating advice and sign up for the free Weekly Flirt. 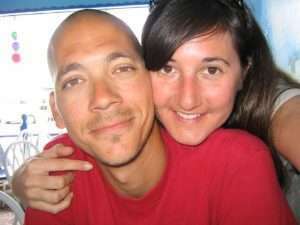 Todd and Rozie were both members of JDate where they were looking for love online. Both the two of them were frustrated with the search process and were about to let their memberships expire. Rozie didn?t even have an online dating profile photo posted and most of the details in her profile were left blank. Todd was hesitant to reply, but figured he’d say hello and ask her to send him a picture. He was glad he did so as when he received Rozie’s photo, he thought she was really cute. After about one month of email exchanges and a few phone calls, they finally met up in person. 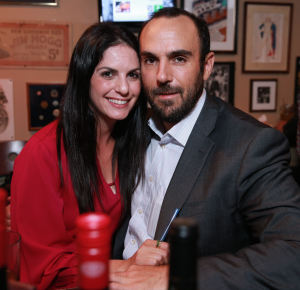 Their first date was scheduled for drinks after work, but the conversation led to dinner. Dinner turned into afterglow drinks and their first casual drink date lasted for seven hours! The two went home separately at 2am, only because they needed to get to work the next day. After seven months of dating, Todd proposed marriage to Rozie in a romantic way at the tallest tower in Krakow, Poland. It was the largest square in Europe. They married a year and a half later and now have two children. Meet Nicole and Gerald from Chesapeake, VA, who met just over 6 years ago on eHarmony. Although Nicole and Gerald went to the same high school in Virginia, Gerald didn’t know that Nicole had a secret crush on him.? Ten years later, they were matched on eHarmony, when they gave online dating a try. Gerald said?he knew Nicole was the one for him on their first date, as she walked into the room and gave him a big hug. Nicole loves the fact that Gerald loves her and accepts her for who she is. Nicole and Gerald were voted in in the Farmers Insurance Dream Wedding promotion. You can watch them get married in front of 52 million television viewers at the 2013 Rose Parade on New Year’s Day. Congratulations to Nicole and Gerald, our Cyber Love Story of the Week who will be starting their lives together as a married couple in a wedding to remember. It’s peak season for Internet dating. Will Nicole and Gerald be an inspiration to you, that you too, can find love on the Internet? 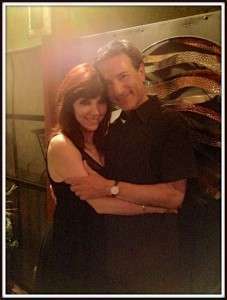 Julie Spira is a top online dating expert and founder of CyberDatingExpert.com. She creates irresistible profiles for singles on the dating scene. Julie’s the bestselling author of The Perils of Cyber-Dating and host of Mobile Dating BootCamp. For more dating advice, sign up for our Weekly Flirt newsletter and like us at Facebook.com/CyberDatingExpert and Follow @JulieSpira. Gail had been a member of JDate for only a couple of days when she received a very funny email. It was so funny that her daughter actually scolded her and said, ?Mom, what is so funny? I?m trying to sleep here.? The email came from Mark, who had been single for 16 years after his divorce, and had his share of dates. 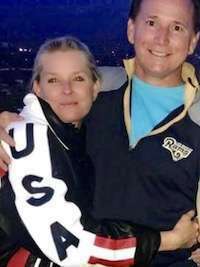 Gail looked at Mark?s profile and realized that he was completely different from anyone she had dated or had been married to. Gail was used to being with lawyers and Mark was a writer and humorist, who had also performed stand-up comedy. Gail liked Mark?s smile, so she responded to his email and they eventually talked on the phone. Mark wanted to meet Gail right away to see if there was any chemistry in person. The two met at Third Street Promenade in Santa Monica, CA for a three-hour dinner date and walked along the promenade watching the street performers. ?His profile picture was no lie,? said Gail. ?He looked about 15 years younger than his stated age. He had boyish good looks and a smile that warmed his soft brown eyes, a backpack thrown over his shoulder, he was neatly dressed and from what I could discern, lean and very nicely built. I was toast.? The two were attracted to each other right away and quickly learned that their birthdays were only two days apart. In less than a week Gail and Mark went on their second date, which lasted the entire day. ?I picked Gail up at her house and we went to the Skirball Center, took in the exhibits, had lunch there, and then went to a screening of the movie ?Rock of Ages where we held hands,? said Mark. The date continued with fine dining at Luna Park restaurant. The two took down their dating profiles within the first month of dating. ?We?ve been together over three months and I?m increasingly more nuts about her,? Mark added. Gail keeps asking Mark, “How is it, exactly, that you have managed to stay single for 16 years?? ?” I guess it will be one of (my) life’s great mysteries and, also, my great fortune.? Congratulations to Gail and Mark, our Cyber Love Story couple who proves that patience is a virtue and the best things in life are worth waiting for. 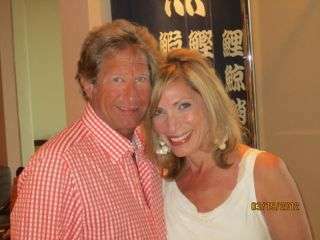 Mark’s dating column can be found at JDate. Do you have an online dating success story to share? Julie Spira is an online dating expert and bestselling author. She creates irresistible profiles for singles on the dating scene. For more dating advice, sign up for our Weekly Flirt newsletter, follow @JulieSpira on Twitter and like us at Facebook.com/CyberDatingExpert. 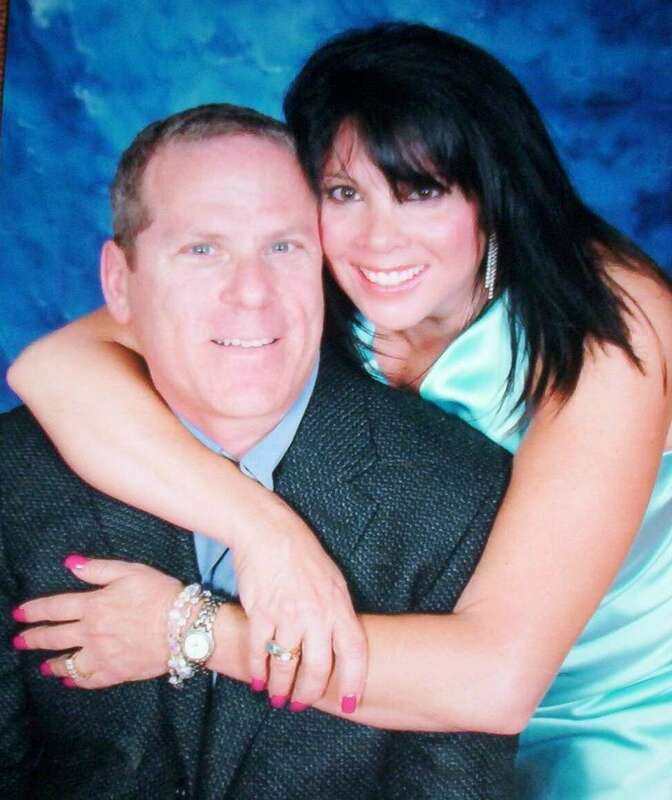 Meet Doreen and Keith, our featured online dating success story who met on OkCupid. After 15 years of marriage, newly divorced Doreen decided to give online dating a try. Doreen’s irresistible profile on OkCupid, along with the catchy screen name of Smiling Artist captured Keith’s attention. Keith, the devoted father of two, had been divorced for three years. He asked Doreen out to dinner. About a week later, they had their first date. ?I felt safe with Keith and there was something about him that made me feel relaxed and comfortable in his presence,? said Doreen. She realized that Keith wasn?t a player and decided to try to get to know him better. On the couple?s second date, they went bowling. Their third date followed shortly afterwards, where the two went hiking. On their 4th date, Keith invited Doreen to go on a romantic vacation to the Virgin Islands for her birthday. She wondered if she should accept his offer so early in the relationship. I suggested that she accept only on the terms that she would have her own room.? Doreen initially declined his offer to go on the Caribbean vacation.? Keith started emailing Doreen photos of the Caribbean, along with his company and Linkedin profiles to prove he was real. After a few weeks, Doreen agreed to go on the trip with the one condition; she must have her own hotel room. Keith gladly accepted Doreen?s request and the two started planning their first vacation away together. While in the island of St. Martin, Keith told Doreen he loved her for the first time. ?I hope I?m making it perfectly clear how I feel about you,? said Keith.? ?I?m in love with you.? I?m not telling you this to hear it back. I?m just letting you know how I feel.? Keith added, ?I?ve never felt this way before, but I can?t help how I feel. I just want you to know.? On their way home while at Passport Control, the Customs agent asked the happy couple if they were returning from their honeymoon. “Next time this year, I hope to say yes,” answered Keith. After three months, Doreen realized that she felt the same way. Unconditionally, she told Keith that she was in love with him as well and couldn?t be happier. 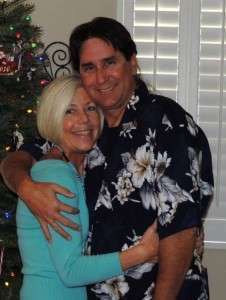 Congratulations to Keith and Doreen who found love online after 50.